SVMs are great for building text classifiers–if you have a set of very high quality, labeled documents. Frequently, we just don’t have enough labelled data! What can we do? Pay mechanical Turks to label the documents. This is actually harder than it sounds. We can use what labels we have, and try to guess the labels of the unlabeled documents. Guessing labels is called Transductive Learning and is the topic of this post. So this seems pretty simple — what could go wrong? Since the initial model has very little labeled data, it is going to make lots of mistakes, even in the high confidence regime. We are adding in some data that is mis-labeled. As we incrementally self- train, we amplify these errors, thereby reducing overall accuracy. So what can be done? where the is the loss function (such the SVM hinge loss or, as here, the L2_SVM loss). There are labelled documents and unlabeled documents , and are adjustable parameters. The constraint fixes the number of positively labeled documents; this constraint I worry about the most because it is the one I use to tune the TSVM parameters — but let’s just assume we can estimate this and move forward. Why does Adding Test Data to the Training Set Improve the Accuracy? When we don’t have enough training data, the SVM optimization problem is still convex, but the optimal solution may be spurious. Imagine that we are trying to train a binary text classifier with only say 100 documents in each class. The classifier will learn how to separate the documents, but it will not be able to generalize to new documents because it simply has not seen enough examples or really enough words to build a usable feature space. 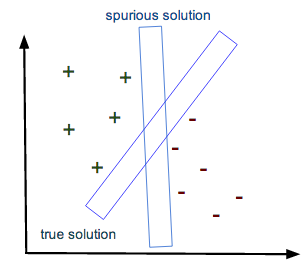 The solutions may be spurios. Indeed, there may exists many margins that separate the data, and the largest may not be the one that generalizes best. That is, without enough training data, the SVM may mis-learn and think that noise words are driving the classification. if we don’t have test labels, perhaps we can guess them. Notice that since we are seeking a maximum margin solution, we implicitly are assuming that the documents form clusters in feature space because the margin lives in the low density regime between document clusters. We are also are increasing the size of feature space, thereby greatly improving the generalizabilty of the model. Unlike a standard (inductive) SVM, the TSVM optimization problem is highly non-convex and quite difficult to solve exactly. Clearly we can not switch the labels on all the new documents; if we add in N documents, then we have combinations to evaluate. So how do we solve it? We will discuss the Deterministic Annealing (DA) algorithm because it is very nice example of how to combine the ideas of SVMs with the techniques of Statistical Mechanics discussed in our last post. Other, more modern Transductive learning algos may use alternate methods such as convex-concave programming (CCCP, available in Universvm ) , and even quasi-Newton gradient descent (QN-S3VM) . In the original paper , TSVM refers to option -A 2, and DA to -A 3. Here, we use the term TSVM to mean any implementation (TSVM, DA, CCCP, QN-S3VM). Because we are applying the TSVM to text, however, we do not advocate using label propagation or other graph based methods. We previously, discussed basic Statistical Mechanics and Simulated Annealing, where we derive the concept of Entropy. where we write to specifically indicate that the loss function is the L2-SVM loss. How do we incorporate probabilities into our SVM optimization problem? We are already selecting the maximum margin of the training data; we now need to also select the optimal probabilities — the minimum Entropy — of the labels for the unlabeled data. Handing this constraint is a bit more complicated, and we refer to ; we do note that the constraint can be re-written into what looks like a Fermi energy, which is quite interesting. and minimize the Entropy on the test set. Solving this optimization problem requires alternating between solving the labeled SVM optimization problem (maximizing the margin ) and finding the optimal probabilities for the unlabeled instances (optimizing ). The result are labels (with confidences) for our previously unlabeled data, and, if we want to use it, a new , inductive SVM model. We also need to be careful not to overtrain. So I will select out the newly labeled data with the highest confidence labels and then use this as training data for the production SVM (i.e LibLinear). This would allow the data scientist to then take a label set of say 100 documents per class, and automatically extend it to say 10,000 labeled documents per class without the use of mechanical Turks or crawling the web. Despite the wonderful advantages promised by Transductive (and SemiSupervised) Learning, it is quite hard to apply in practice and has not achieved even close to the popularity of its Supervised and Unsupervised counterparts. TSVMs need both proper tuning  and well designed data sets. We need to understand it’s practical implementation much better to use it. which makes it far more probable that some instances will lie in the slack region between classes. We usually run a tool like LibLinear , which implements either a soft-margin SVM or L2-regularized Logistic Regression. Indeed, in practice is usually impossible to tell the difference between these 2 models. The additional slack terms can be though of as an extended regularizer or as modifying the SVM loss function. Indeed, even Vapnik himself has argued that it can be very beneficial to run an SVM with a large number of adjustable slack variables (i.e in master learning and/or his universum model ). The SvmLin implementation of the TSVM is a hard margin (binary, no slack variables) SVM, but it does use the L2-SVM loss function (and not the harder hinge loss). It is suggested to run the TSVM slowly and repeatedly to relabel documents, and, on each iteration, to only take new labels that have moderately high confidence (and therefore, hopefully, outside the slack region). Of course, there is always the risk of biasing the data set, and it may be better to augment the selection process by selecting documents that are high confidence and close. For example, in the S4VM approach, they high confidence documents that are also close to the labeled documents, as determined through a hierarchal clustering method. In between each stage, it would be useful to apply a mechanical turk to check the results to ensure the newly labelled data is not bananas. Additionally, SvmLin only implements a binary SVM, whereas many practical applications require a multi-class SVM. More generally, one might try to extend the TSVM to a DA type algorithm using say a Potts model–a classic model in physics that generalizes an Ising model. MultiClass Transductive Learning is a topic of current research. For now we have to use SvmLin or a related package (Universvm, QN-S3VM) to get practical solutions. In a normal SVM, balancing the class data is important; in a Transducitve-SVM, it is absolutely critical. For example, this recent study on TSVMs discussed the issue. This can be quite challenging in real world, production environments, and if you want to apply this powerful technique, extra care should be taken to design the TSVM (training + test) sets. For example, suppose we have a 4 class model, but we only have a few labeled instances for each class. If we try to extend the set of instances for class 1, we need to carefully construct four 1-vs-1 binary TSVMs, and not one large data set for a 1-vs-all binary TSVM. Each individual binary TSVM classifier should be designed carefully so that each class (+/-) consists of a single kind of document;. Otherwise the solver will get trapped in a local solution and the TSVM will be worse. Furthermore, the fraction is a normalization constraint, and keeping it fixed means the negative set must be carefully constructed to ensure that final result has positively labeled instances that represent the actual positive class well. This is not easy to ensure and it may be necessary to sample the unlabeled data using mechanical turk or advanced techniques to estimate the true fraction in the unlabeled data. The TSVM can help add labeled data to a well designed model; it can not be used to repair a poorly designed classification model . Consider a binary SVM trained on a small training set of cat and dog videos. We then apply the model to some unseen test videos, and select a large number of videos that were labelled either cats or dogs. The model will certainly make mistakes, but we can hope that the errors are balanced across both classes. 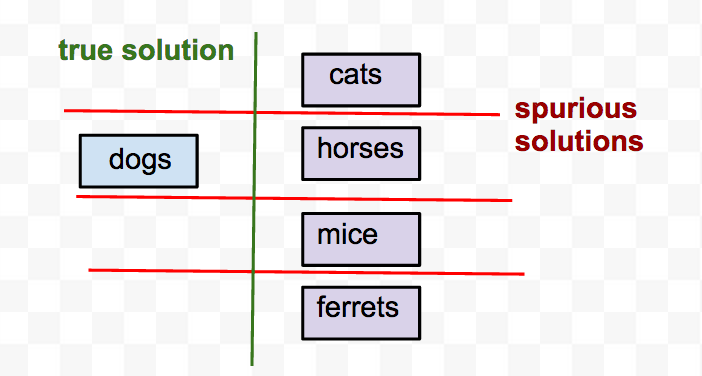 So when we apply the TSVM to the entire training + test set, half of the data will still actually be dog videos. 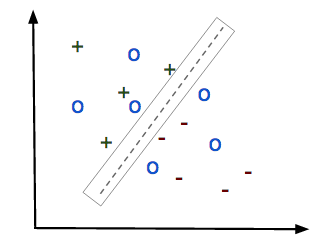 On the other hand, let’s consider the poorly designed classifier shown below. Here, we have 3 classes: dogs, cats, and animals. The third class is trained for animal videos, and may contain dogs, cats, horses, mice, etc. This is a bad design, and we would see this, say, in the confusion matrix for the entire model. Even if we create three 1-vs-1 TSVMs, we are not going to get anywhere. When we create the increment set, to train the TSVM, we have no idea what fraction of the training + test set are actually dog videos. So we can not really fix the normalization constraint , and resulting TSVM model may behave screwy. We would need a way to estimate . Ideally, each (+/-) class must effectively capture a single, simple text cluster. Transductive Learning was first proposed by more than thirty years ago by Vapnik and Chervonenkis  , and it is a critical idea in the development of the famous VC Theory of Statistical Learning . In a future post, we will look in detail at the role of Transductive Inference in the VC theory and some other formulations such as the UniverSVM and Instance Weighted SVMs . It appears the enterprise tool RapidMiner does implement a commercial version of a TSVM, although I personally have not tried it. In our next post, we will run some experiments with the SvmLin code and see how well it works on some real world datasets. At some point in the futurem we wlll discuss  and what (we think) is going on at Google Deep Mind. Vladimir Vapnik. Statistical learning theory. Wiley, 1998. ISBN 978-0-471-03003-4. Thanks for this interesting post, Charles. Does restricting the hyperplanes to pass through the origin often limit performance? Do you have a twitter account which I can follow? Please @charlesmartin14, can you pls give me the list of Tools/Packages that have full implementation of TSVM? do you know anything about Transferred Discriminative Analysis (TDA) algorithm? It can be used for dimensionality reduction in a transfer learning domain? I need some information about the algorithm. Thanks. also remember to make these methods work you need to be able to estimate R = fraction of positively labelled examples. Essentially, we can consider the TSVM as guessing the unknown labels and is therefore an unsupervised clustering method. To that end, we can select the best R by using a metric that selects the best clusters given a labeling, such as the silhouette score.